For the first time in 2013, MISN decided that we would host a series of events and actions over the course of a month instead of the weekend-long conference we’d held for the past several years. We called this season of intense mobilization and action to resist mining injustices Spring into Action. The first Spring Into Action took place from mid-April to mid-May 2013 and included events ranging from panels, film screenings, and art exhibits to direct actions, creative protests, and outdoor teach-ins. This month-long event series highlighted the work done by our community partners in addressing mining injustices at home and abroad. The following information is a summary of the events that took place during this season! April 14th, 2013: Art Build! All were welcome to take part in an art build to create street theater props, paint banners, stencils, and contribute to ongoing campaigns against the destructive actions of Canadian mining companies in Canada and abroad. The materials created through this art build were brought to shareholder meetings to confront shareholders and executives on the devastating impact of their operations on local indigenous communities and the environment. For those that were less familiar with mining issues, we had an informal teach-in as we built. The event was hosted by researcher and activist, Sakura Saunders, who took participants on a tour of the process that started with a contract and ended with the take over of public institutions, the repression of the truth, and corporate impunity. The rhetoric of development is often deployed as a means of legitimizing neoliberal projects. This event examined the ways that neoliberalism, as a set of policies and a governing logic, has differential impacts on the lives of women in the global South, examining two specific cases. Michelle Baobala (MA Candidate Development Studies, York University) addressed the disjuncture between the Millennium Development Goals’ (MDG) rhetoric of gender equality, implementation on the ground and the lived realities of urban Guyanese women. The MDG’s are significant, as the global framework by which the international donor community adheres, underpinned by a neoliberalizing logic. Stacey Gomez (MA Candidate Development Studies, York University) shared the struggle of Maya women in defense of territory in San Juan Sacatepéquez, Guatemala. Since 2006, the Movement of the 12 Communities has been contesting a project entailing resource extraction and cement production, the initiative of Guatemalan company Cementos Progreso, allied with transnational capital. 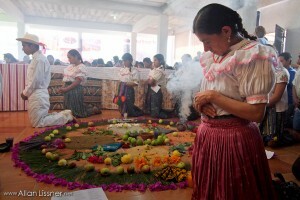 She discussed the ways Maya women’s lives have changed since 2006, as well as their participation in resistance efforts. In Guatemala, mining, as well as other megaprojects are touted as forms of development, often meeting resistance from communities who contest this vision. These presentations highlighted alternative understandings of development, different conceptions of solidarity, and transformation of research into change. After these brief presentations, there was time for a question and answer period, as well as a discussion. This event included a screening of The Devil Operation (2010, Stephanie Boyd) followed by a discussion with Roxana Olivera. Roxana Olivera spoke about on-going community struggles in Cajamarca, Peru against the Conga mining project (Yanacocha) and the repression faced by opponents of the project. Protesters faced brutal repression during the regional protests and strikes last year, and the protagonist of the film – Father Marco Arana – was beaten and detained by the local police. Members of the featured community organization GRUFIDES continue to experience intimidation and break-ins at their homes. The proposed Conga mine near the city of Cajamarca by the controversial Minera Yanacocha (majority owned by U.S.-based Newmont Mining Corporation) has been stalled by huge regional opposition but is still on-going. Synopsis of The Devil Operation: Father Marco, a humble priest from the mountains of Peru, is being followed. A private security firm is filming and photographing the priest’s every move; their meticulous reports are code-named “The Devil Operation.” Marco’s allies are murdered and tortured, but he and his disciples refuse to be victims. They turn their cameras on the spies and develop a counter-espionage plan that leads to South America’s largest gold mine, owned by the Newmont Mining Corporation of Colorado. For the past two decades, Father Marco has defended farming communities against the Yanacocha mine’s abuses, earning him the nickname ‘The Devil.” Peru is one of the world’s top gold producers and the state has ceded power to transnational corporations who guard their territory like outlaws in the Wild West. Film-maker Stephanie Boyd has spent 10 years documenting the farmer’s struggle and became caught up in this real-life political thriller. On April 21st a get-together was held at Whippersnipper Gallery for some good conversation, great company, and fun art-building stuff! Rising Tide and the Mining Injustice Solidarity Network brought everything needed for attendees to be May Day ready, so that they could bring only their creative selves! Why the Canadian Department of Foreign Affairs and International Trade and Canadian NGOs should not be allying themselves with the Canadian mining industry. Guest speakers included Jennifer Moore (Mining Watch Canada), Stacey Gomez (MISN), and Allan Lissner (MISN). 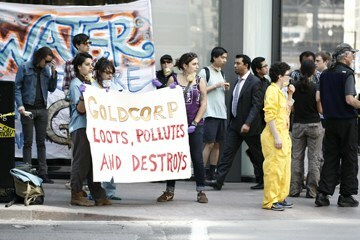 Once a year, the board of Directors of the world’s most powerful gold mining corporation converge in downtown Toronto. In countries around the world, Barrick takes advantage of inadequate and poorly enforced regulatory controls to rob indigenous people of their lands, destroy sensitive ecosystems and agricultural land, support brutal police and security operations, and sue anyone who tries to report on it. 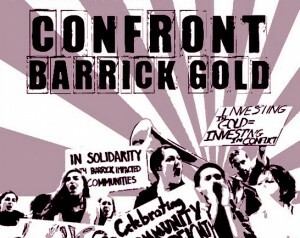 In the context of this libel chill, Barrick has branded itself as the socially responsible mining giant and boasts its listing on the Dow Jones Sustainability Index. Behind the scenes, Barrick has been singled out as the company most involved in the lobbying effort to stop private member’s Bill C-300. This bill would have withdrawn government funding and diplomatic support for companies found – after an investigation – to be abusing human rights or violating international environmental norms. Meanwhile, gang rapes and killings are just the tip of the iceberg when it comes to the abuses that stem from the militarization of Barrick’s Porgera and North Mara mines. In both places, people are killed and arbitrarily detained regularly by the police and security. In the Porgera valley, mine waste is dumped directly into the rivers, poisoning hundreds of kilometres of waterways in one instance and turning a valley into a marsh of quicksand in another. The quicksand valley is swallowing up schools and houses to landslides, forcing people to move further and further up the mountainside to live. In North Mara, 40,000 small scale miners were economically displaced for the creation of the mine, left to scavenge for survival in the waste dumps of Barrick’s mega-mine. In other words, these mines present human rights crises in themselves, that aren’t going to be resolved with a nicely worded human rights policy or a limiting remediation package. Susana Caxaj, a community-based health researcher also discussed some of the health issues prevalent in San Miguel Ixtahuacán, a region impacted by Goldcorp mining operations. See http://healthtribunal.org/ for full details on the health tribunal. Canadian mining companies are harming the rights and workers of communities in Latin America. In Mexico, workers at Excellon Resources’ La Platosa mine in Durango are fighting for union recognition. The community of La Sierrita is fighting to assert its rights to a fair share of the economic benefits of resources, and to minimize negative impacts of mining. 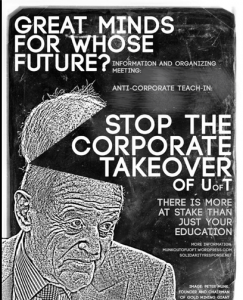 Together they are organizing to build a future for themselves and their community. Excellon’s annual meeting was held in Toronto on April 30, and two members of La Sierrita came to Toronto to speak directly with Excellon shareholders. Attendees lent their voice to support workers and community members in their campaign for fairness from Excellon. Canadian mining company Goldcorp has left over 20 toxic sites at current and former mines in Guatemala, Honduras, Mexico and Canada, among other places. At this protest, we demonstrated their legacy of toxic waste at their annual shareholder meeting at the Trump Hotel in Toronto. We cordoned off a hazardous zone around the meeting to highlight the serious threats that Goldcorp has posed to the communities where it has operated, ranging from mysterious rashes, to respiratory problems, food insecurity, water quality issues, violent attacks, cracked houses and mental health problems. We had masks and other safety gear on hand to protect Torontonians from the extreme levels of toxicity that Goldcorp brings wherever it goes. From North to South, Turtle Island, El Salvador, Guatemala, Mexico, Honduras, Chile and everywhere, stand in solidarity with Goldcorp-affected communities! 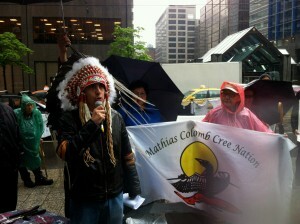 May 9th, 2013: RESIST CORPORATE COLONIALISM: Mathias Colomb Cree and Aamjiwnaang Speak out! This sit-down event featured Chief Arlen Dumas of the Mathias Columb Cree Nation and Vanessa Gray from Aamjiwnaang First Nation, and included multi-media presentations, speakers from impacted communities, and representatives of Idle No More. At this teach-in against corporate colonialism, attendees learned about the Mathias Columb Cree Nation’s struggle to stand up to mining company Hudbay’s efforts to criminalize them as they assert their rights to live off of and protect their land and waters as guardians of their territory, and learned about Mayan Q’eqchi’ communities in their pursuit of justice for the violence carried out by Hudbay security in Guatemala. The event also featured Vanessa Gray from Aamjiwnaang First Nation. Vanessa is a founding member of ASAP (Aamjiwnaang and Sarnia Against Pipelines) and organizes for Environmental Justice and against Enbridge’s Line 9 reversal proposal in her home of Aamjiwnaang/Sarnia. 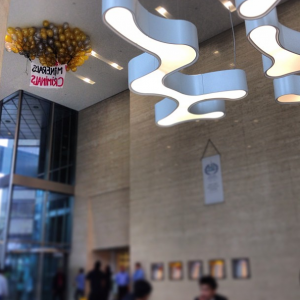 300 helium balloons holding a sign saying “Hudbay Minerals Corporate Criminals” were released inside the Hudbay AGM. Around the world, Hudbay robs Indigenous people of their lands, destroys sensitive ecosystems, supports brutal police and security operations, and sues anyone who tries to resist their mining projects. Once a year, the board of directors of Hudbay, a Canadian mining company infamous for human rights abuses around the world, converge in downtown Toronto. …in solidarity with Mayan Q’eqchi’ communities in their pursuit of justice for the violence carried out by Hudbay security in Guatemala. …in solidarity with the Mathias Colomb Cree Nation as they stand up to Hudbay’s efforts to criminalize them as they assert their rights to live off of and protect their land and waters as guardians of their territory. …to hold Hudbay accountable as its executives, board of directors, and powerful shareholders gather here in Toronto. 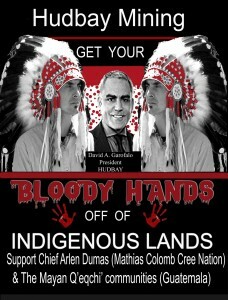 …to stand up to corporate impunity and the continued colonization of indigenous territories across Turtle Island and the world! The Mathias Colomb Cree Nation was never consulted by Hudbay or the province regarding this mining operation on their territory and thus issued stop work notices to the company. In response to their peaceful gatherings at the mine site, the Mathias Colomb Cree Nation was served an injunction, making it illegal for the MCCN people to go on their own territory, which is now considered mining company property. The effect of this injunction is that the MCCN people who live off of the land were instantly criminalized and considered in contempt of court for continuing to hunt, fish, and protect the land and waters of their own territory. The Mining Injustice conference offered an important space for allies to come together every year and strategize around how best to combat mining injustices. This year – in the absence of a conference – we planned a gathering so that activists and allies in this field could meet and coordinate actions together. The gathering was intended to bring allies together to plan and coordinate strategies for resistance to mining, and to have a space where we could share ideas, share food and music, and refresh ourselves in each other’s company. Politics and pleasure!